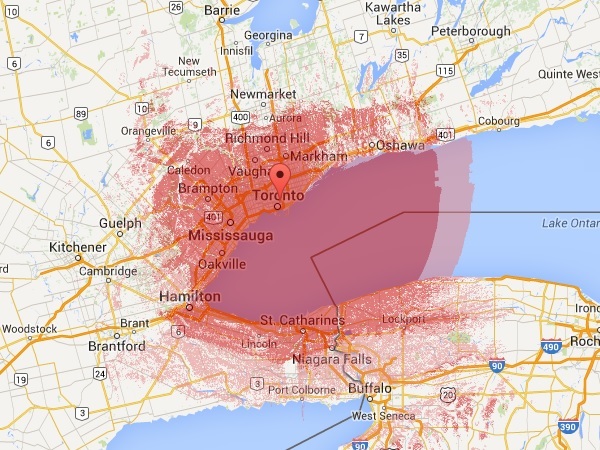 A RF coverage map generated for the VA3XPR repeater in Toronto, Canada, using Radio Mobile Online. Have you ever wanted to create an RF coverage map to find out how good the repeater coverage would be from a certain location? Perhaps you’re curious as to how good the simplex range is from your home station. Either way, there is a quick and easy way to generate RF coverage maps for your specific application available for free online! Radio Mobile Online is a radio wave propagation prediction tool created and maintained by Roger Coudé, VE2DBE, which is dedicated for use by the ham radio community. As indicated on the Radio Mobile Online website, it uses digital terrain information and a mathematical model to simulate radio transmissions between two fixed sites or between a fixed site and a mobile. The digital terrain information comprises three databases: ground elevation, land cover, and population density, which combined total 200 GB of information. To generate an RF coverage map using Radio Mobile Online, all you need to do if follow the three easy steps below. Go to the Radio Mobile Online website and create a free account. You can do this by providing your name or callsign and email address. Once you enter this information, you will receive your password to enter the site via the email address you provided during registration. Once you have created your account and logged into Radio Mobile Online, you will now seen a menu on items on the left side of the page. Before we can create any RF coverage maps, we first need to define the location of the transmitter that we want to determine coverage for. To do this, simple select the “New Site” option in the menu. Once you have defined your transmitter location, it is now time time create a RF coverage map for that location. To do this, select the “New Coverage” option in the menu. You will now see a number of data fields that you’ll need to complete with some already containing default values. An explanation of each of these is below. Centre Site – this is the location of your transmitter. Select your location using the pull down menu. Antenna Height – this is the height of your antenna above the ground at that specific location. Please note that this is in metres and if you want to convert your height in feet, divide the value by 3.2808 (i.e. 100 ft = 30.48 m). Antenna Type – this is the type of antenna that you will be using at the transmitter location. Unless you’ll be using an antenna with an offset gain, you should just use the default omnidirectional, or “Omni” setting. Antenna Azimuth – this is the direction that your antenna will be pointing, with 0° being north. This value is only important if you are using an antenna with an offset gain value, as it would not have any impact for an omnidirectional antenna. Antenna Tilt – this is the angle of radiation of your antenna with 0° point towards the horizon. Some antennas have a higher gain value point slightly upwards or downwards, so this setting can be used to address this. Antenna Gain – this is the amount of gain for your specific antenna. To find out the gain value for your antenna, you may need to check the specifications that are published for it by the manufacturer. Please note that the value for this field is in dBi (isotropic) – if your antenna has a dBd (dipole) value, you can covert dBd to dBi by adding 2.15 dBi (i.e. 5 dBd = 7.15 dBi). Mobile Antenna Height – this is the height of the receiving antenna on the mobile station that will be used to determine your coverage area. Again, please note that this is in metres and if you want to convert your height in feet, divide the value by 3.2808 (i.e. 10 ft = 3.48 m). Mobile Antenna Gain – this is the gain of the receiving antenna on the mobile station that will be used to determine your coverage area. Please note that the value for this field is in dBi (isotropic) – if your antenna has a dBd (dipole) value, you can covert dBd to dBi by adding 2.15 dBi (i.e. 5 dBd = 7.15 dBi). Frequency – this is the frequency that your transmitter will use. Radio Mobile Online allows frequencies to be used within amateur radio bands from 10 MHz to 250 GHz. TX Power – this is the power output of your transmitter in Watts. TX Line Loss – this is the power loss in your feed line cable between the transmitter and antenna at your transmitter location. The longer the feed line, the higher this value will be. To find the value, you should check with the cable manufactures specification for your feed line and calculate the total loss based upon the length of your cable. For added precision, you can also include the power loss in your connectors as well. RX Line Loss – this is the signal loss of the feed line for your receiving station in dBi. RX Threshold – this is the lowest signal level that the coverage map will display. While most radios have better receive sensitivity than this, this value will provide a good indication for coverage for all radios, including older one with less sensitive receivers. Required Reliability – this figure displays the reliability to which the coverage is likely to experience. For more accurate coverage maps, you can increase this value, however the resulting coverage area will less. Maximum Range – this value defines the limit of the coverage analysis. If you expect coverage beyond 100 km, then increase this value to show coverage beyond 100 km. Please note that if you want to convert from miles to kms, multiply by 1.6 (i.e. 100 mi = 160 km). Once you have entered all of this information, Radio Mobile Online will begin generating the RF coverage map for your transmitter location. Depending on the details entered and the time of day to which you have requested the RF coverage map to be generated, it may take anywhere from a few minutes to 20 minutes to produce the coverage map. Once it’s complete, a map will appear displaying your RF coverage area. To save this RF coverage map, click “Add to my coverages”. One important note for coverage maps being generated in major cities is that Radio Mobile Online does not have building information included in its database, so the coverage maps it produces will not reflect the impact of buildings on the signals proportion. The result of this will be coverage maps that are not representative of the actual signal levels that a users may experience, especially in urban areas. So there you go – you’re now on your way to creating professional looking RF coverage maps that can be used to determine how good that proposed repeater site will be that can shared with friends or posted online.